Today, I’m reviewing my favorite reading curriculum – All About Reading! We’ve tried quite a few programs in the 8 years we’ve been homeschooling. My Big Girl used this one when she learned to read. Timberdoodle gave us a free copy of the All About Reading Pre-Reading Deluxe program to review. In addition to the All About Reading Pre-Reading, I’d already purchased All About Reading Level One for Man Cub. 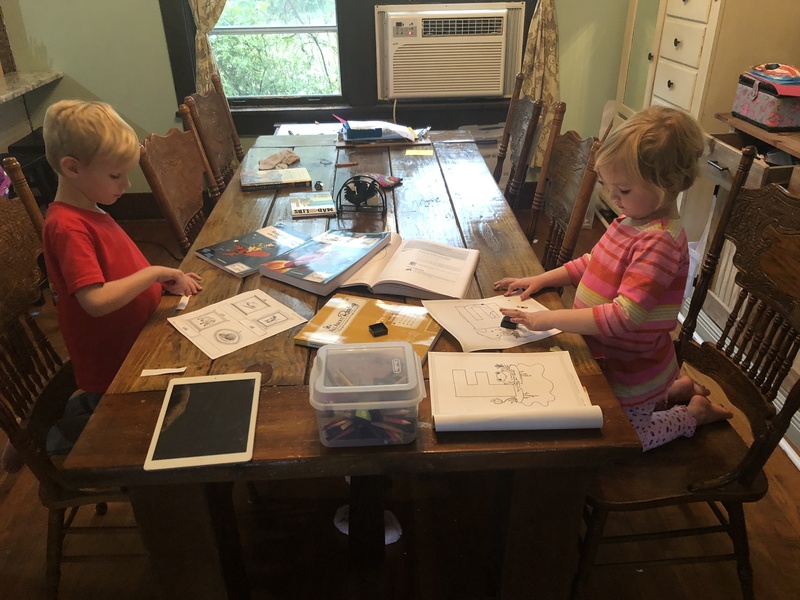 In this review, I’m going to tell you about how I manage a pre-schooler with the AAR Pre-Reading and a Kindergartener in Level One. When I first considered both programs, I was a little overwhelmed at the idea of keeping up with all the tiles you use in Level One. My Little One (who is using the Pre-Reading program) is a bit of a hunter gather of little things. 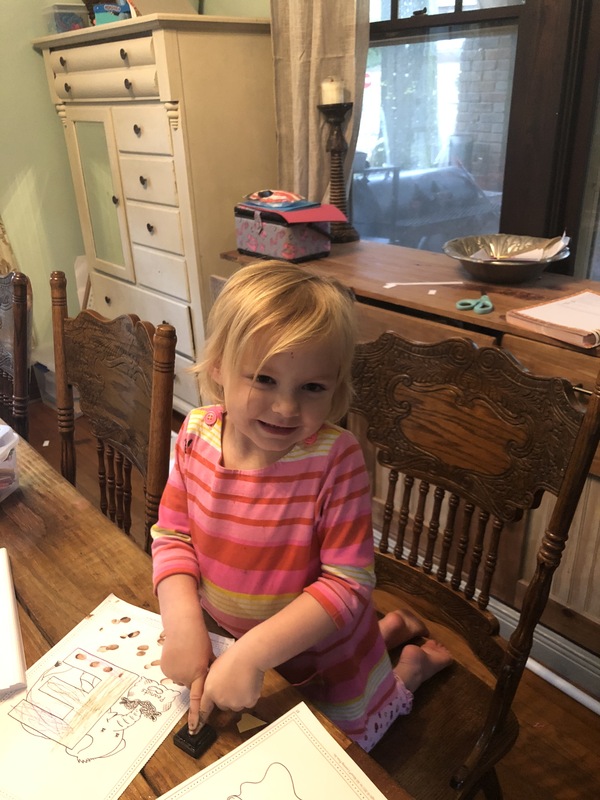 She’s always “packing” baby wipe boxes, shoe boxes, and purses with little things for her five “babies.” She is super creative and has a big imagination, but with that comes the danger of missing pieces. 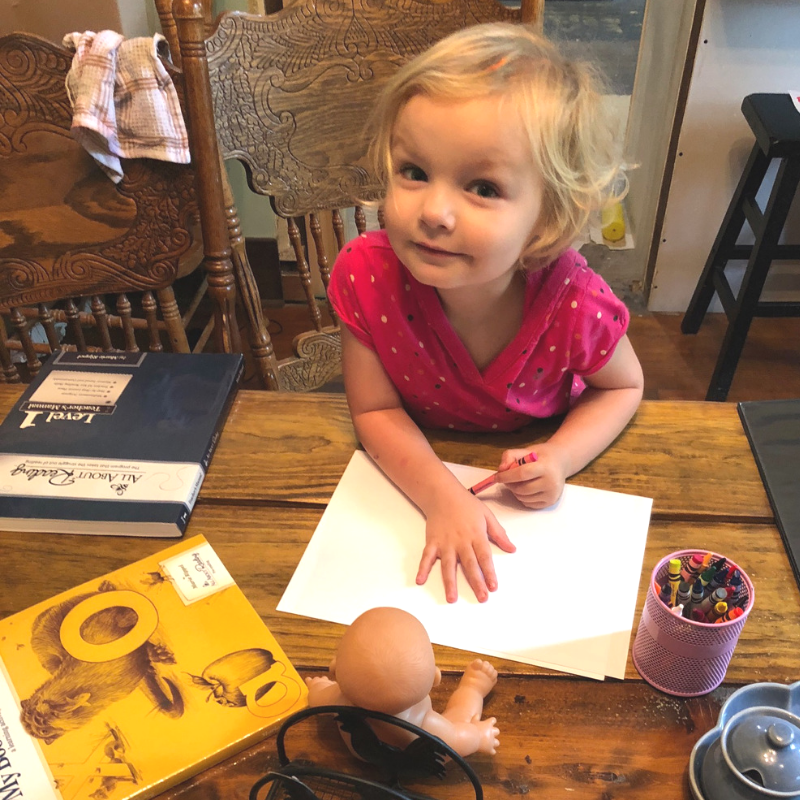 My baby and her baby working on the cover for their Book of Letters. This baby is going to be a genius because she goes everywhere with us. Well, the good news about AAR Pre-Reading is that there are no little pieces to lose. AAR Level One now has an app for the iPad too. And my tech-obsessed Kindergartener loves using his iPad for anything. So, while we have the tiles, we’re not using them because the app is just what we need. I try to work with both of my littles in the same workspace (our dining room) while my fifth grader does her independent work in my office. I’m within earshot, but not right on top of her and we can close our dining room off to the rest of the house. I love that AAR gives you a quick overview of the lesson and then scripts the lesson on the next pages. I’m able to quickly gather our cards and any necessary supplies for our reading lessons because it’s all listed right there on the teacher prep page. The other advantage of this program for Mama the teacher is that you can easily skip over skills your child has already mastered. 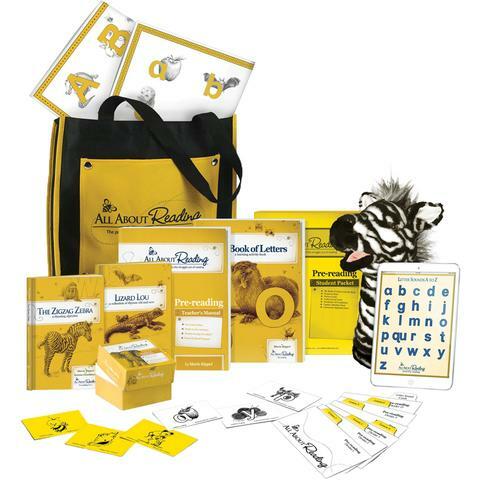 For instance, my son who is in AAR Level One knows all of his letter sounds. So, we might quickly check the sound and then move on to words. We all sing the alphabet song and act silly to get the wiggles out. I give my pre-schooler the letter of the lesson sheet to color or paint. She works on that while I teach my Kindergartener his lesson. I try to keep it to 5 minutes because my Little One is quick to finish her letter of the day. We then put her letter page in her Book of Letters (such a fun way to review). Next, we read the poem from the Ziggy the Zebra alphabet book and play a game with Ziggy (a puppet who is learning to read). 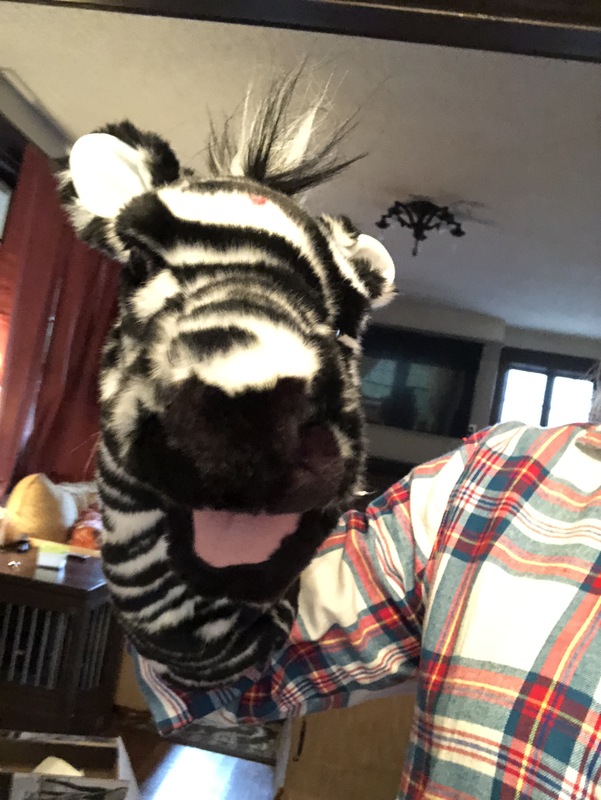 This puppet comes in the Deluxe AAR Pre-Reading Program. This is an excellent active activity for both children. 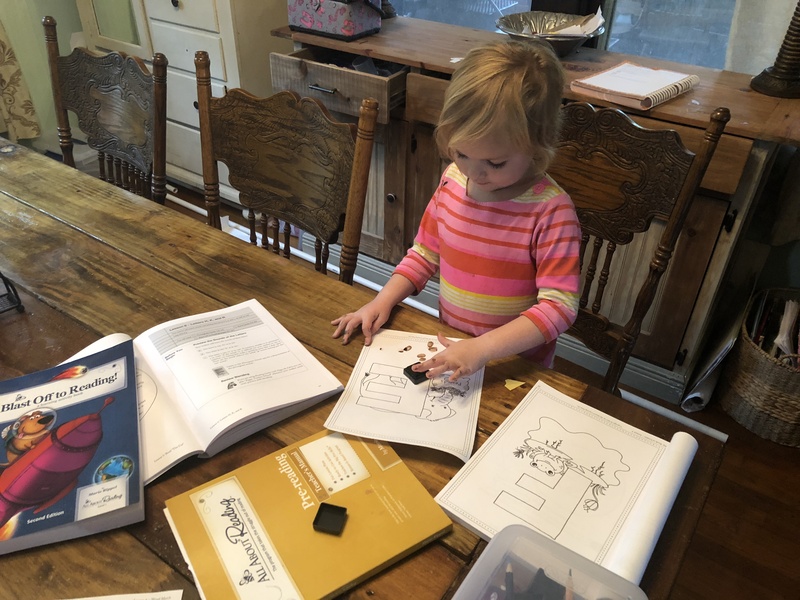 The Kindergartener gets to work on rhymes and beginning sounds while we kick words out of the wagon (Get Out of the Wagon is one of the Pre-Reading games). They adore the puppet and the games really reinforce the lesson. 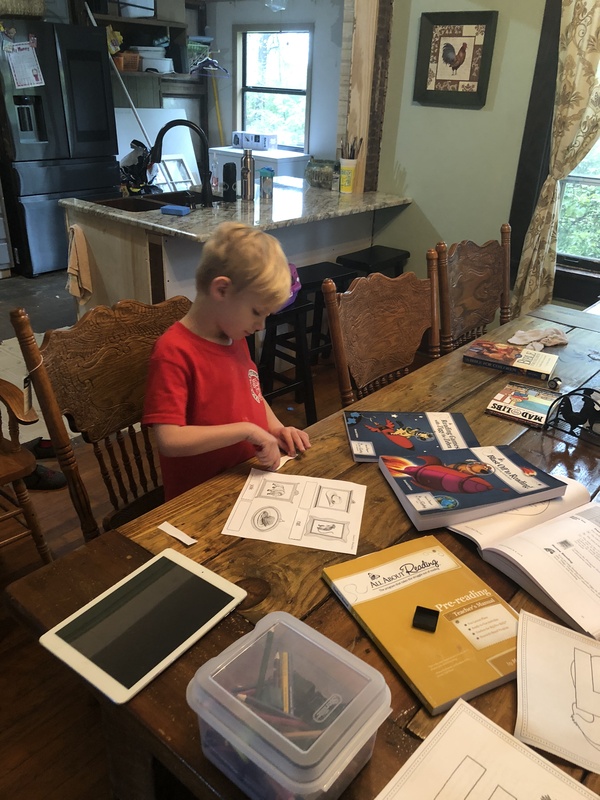 Then my Kindergartener does his activity from AAR Level One (matching pictures to words or something similar) while the preschooler and I do an activity from p. 195 of the AAR Pre-Reading. This is a list of ideas to reinforce the letter of the day. Finally, I send the preschooler to draw on her easel or play with play dough (she’s usually ready to make lunch for Cute Little Baby who joins us for all activities) while I finish the reading lesson with my Kindergartner. He usually reads to me or has words to practice. We then read a book aloud all together and snuggle. This excellent program is play-based and very helpful for introducing your child to the letters in their PreK years. I don’t believe in teaching reading too early, so this is a great bridge to formal reading lessons. We are also taking this program slowly. It’s designed to go at YOUR child’s pace. You can do the letters quickly (capitals in a semester at 2 letters per week and the lowercase letters in a semester at 2 letters per week). This adds up to about 26 weeks of instruction. We’re doing a letter a week because my preschooler is a young 4-year-old. I recommend using it when your child starts asking about letters and sings the alphabet song on a regular basis. All About Reading Pre-reading Scope and Sequence. Timberdoodle offers this program as part of its Pre-K curriculum package. You can also buy it as a stand alone product through Timberdoodle. I hope you enjoyed this review. We love All About Reading. I’d be happy to answer questions. Just drop me a comment below. What a great blog post! I love how you teach both of your little ones together in each of their programs. Great view of this part of your day. Thanks! Hey Merry! Thank you! It’s together or someone is on an epic quest to empty a cabinet of art supplies or the vacuum cleaner. I love that these two are so close in age, and I hope we can keep them together for most subjects as they grow. Thanks for stopping by!